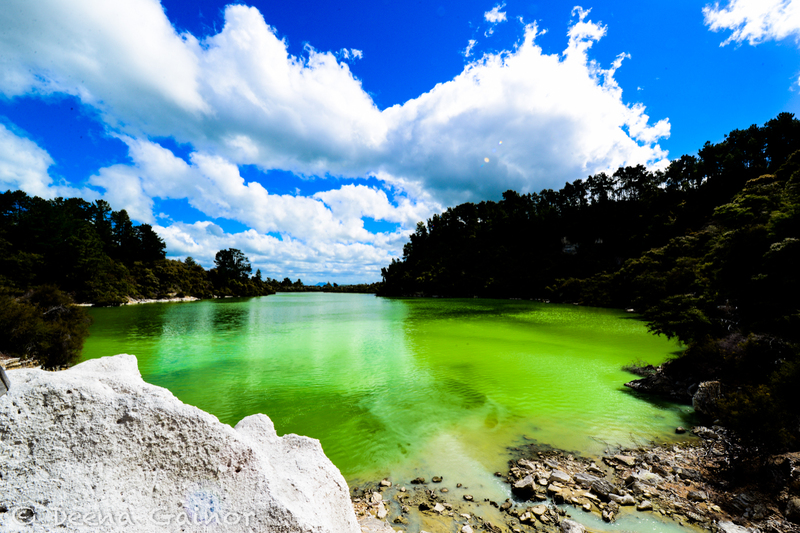 Wai-o-tapu Geothermal Wonderland is quite likely one of New Zealand’s most colorful, most diverse geothermal experiences. 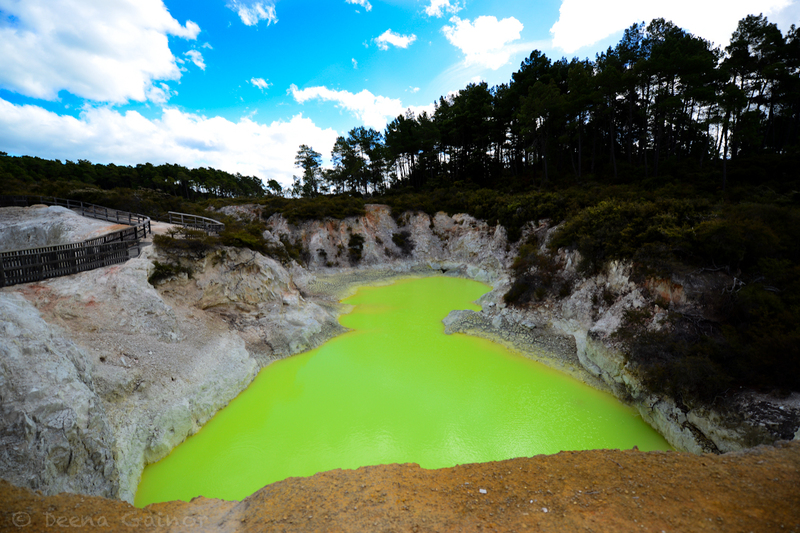 This must-see destination is located close to both Rotorua and Taupo and offers three different walks of varying lengths that highlight the geysers, hot springs, and volcanic activity New Zealand is famous for. The walks are relatively easy, though they could prove to be challenging to those who have problems with mobility. 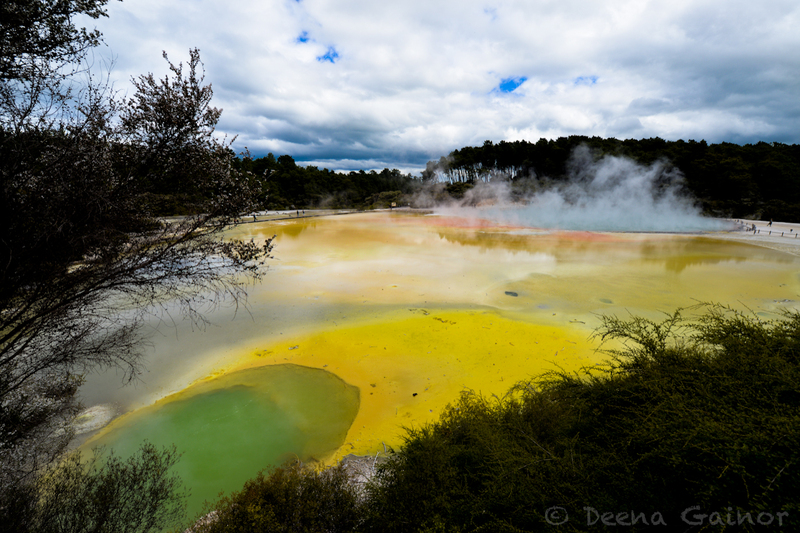 At Wai-o-tapu, you will find intensely colored springs, bubbling mud pits, and steam rising throughout. The greens, reds, oranges, and yellows are almost unbelievable and are the result of different minerals (even arsenic, which I found very interesting!) The smell, on the other hand, is not so sweet, but that’s to be expected, and we got used to it pretty quickly. These are the real colors! 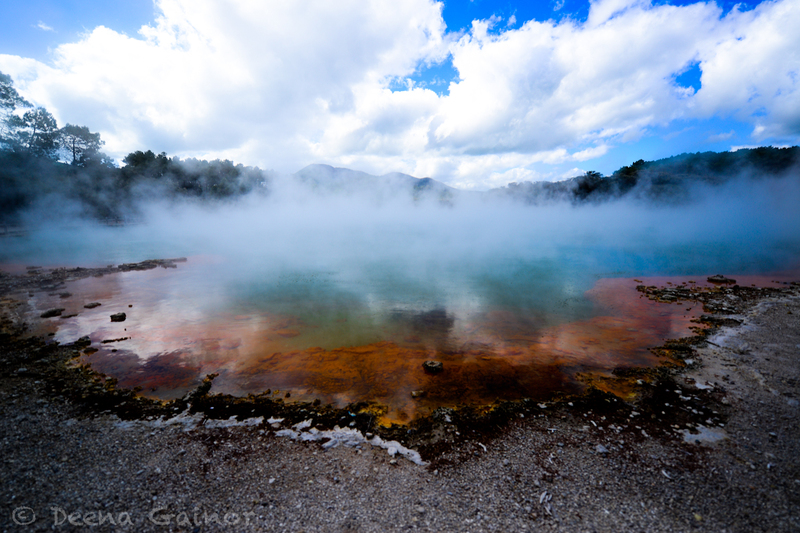 The Visitor’s Center and the staff at Wai-o-tapu are extremely friendly and helpful. 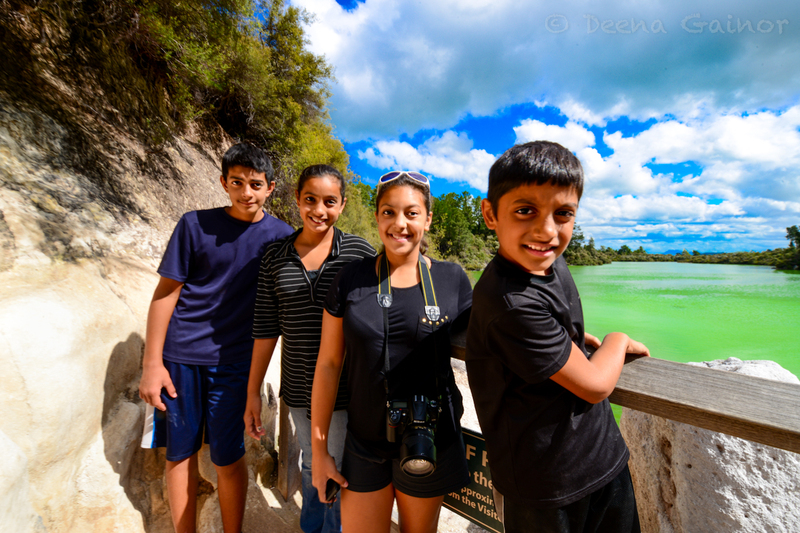 They know and love Wai-o-tapu and are eager to share their love with guests. We spent a little time chatting with one woman in particular, who got the kids really excited about what they were about to see. We really appreciated that. The Champagne Pool (pictured above) was one of my favorites. Look at that combination of gorgeous colors with the steam escaping and the mountains in the background. Yes, I most definitely could have spent more time here trying to capture the beauty. We were here late afternoon until closing time, so we were treated to very still water and reflections of clouds in the water. And since we traveled just before peak season (which starts sometime mid-December), we were not overwhelmed with a ton of other guests, so we really had time to enjoy everything at our own pace. Now, had I not seen Devil’s Bath (above) with my own eyes, I never would have believed that it wasn’t totally photo shopped, the green was surreal. When we returned to the Visitor’s Center, the staff explained how the hot temperature of the water allowed the surrounding minerals to be absorbed into the water. There was an interesting balance between cooling and heating as well as gas escaping, which all contributed to the brilliance of the colors. Fascinating, really, but hard to completely comprehend, so I apologize for my lack of a true explanation. 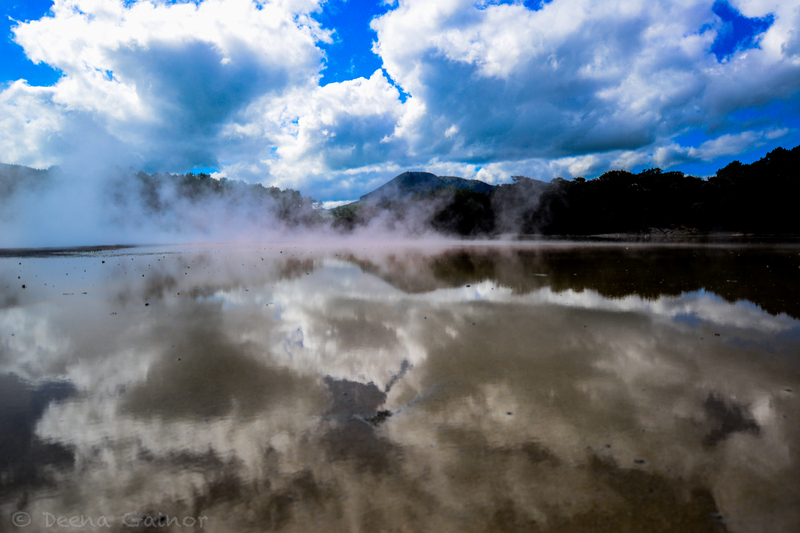 Either way, Wai-o-tapu is definitely worth the visit. We were really impressed and would love to return.